China’s Ministry of National Defense revealed in late December that a new lightweight battle tank has entered service. China’s People’s Liberation Army (PLA) has inducted a new lightweight tank, China’s Ministry of National Defense (MND) reported in late December. During a press conference on December 27, a defense ministry spokesperson said that the ZTQ light tank, also known as the ZTQ-15 or Type 15 (export designation VT-5), has officially entered service with the People’s Liberation Army Ground Force (PLAGF). “As for the Type 15 lightweight tank, according to my information, it has been handed over to our troops,” the spokesperson said without providing additional details. Two scaled models of the new tank were for the first time publicly displayed at an exhibition showcasing new weapons systems at the National Museum in Beijing in November 2018. Developed by China North Industries Group Corporation (NORINCO), the first images of the new 32-35-ton lightweight tank appeared in 2010. An export version, the VT-5, was displayed for the first time in 2016. China’s MND then announced in June 2017 that it had conducted test trials of the ZTQ-15 on the Tibetan Plateau in western China. The tank appears to have been specifically designed for service in high altitude regions as a an armored reconnaissance and infantry support asset. 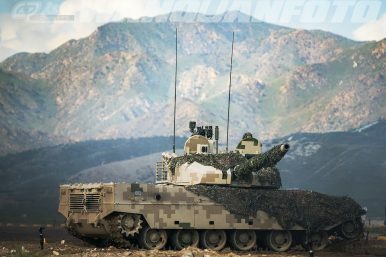 There has also been speculation that the new tank will be used for amphibious warfare operations by the PLA Marine Corps (PLAMC) following the posting of an image, published in mid-July on a Chinese language website, which appears to show a ZTQ-15 painted in the blueish gray PLAMC camouflage. The tank is purportedly armed with a 105-millimeter gun fitted with a thermal sleeve and fume extractor. Similar to guns on other Chinese MBTs, the ZTQ-15 ’s gun may also be capable of firing laser-guided anti-tank missiles, next to kinetic energy penetrators and high-explosive anti-tank warheads. Furthermore, the [ZTQ-15] is equipped with a state-of-the-art fire control system and features an autoloader like all Chinese tank designs. Next to the 105-millimeter tank gun, the [ZTQ-15] is reportedly armed with a 35-millimeter grenade launcher and a 12.7-millimeter machine gun. The tank can reportedly [also] be fitted with advanced composite armor and explosive reactive armor. The tank, according to Chinese defense commentators, has a 1000 horsepower engine, which is significantly lighter than the engines of other PLAGF MBTs The ZTQ-15 has reportedly also been fitted with a new hydropneumatic suspension system to facilitate operations in mountainous regions. According to Chinese military commentators, the PLAGF plans to induct up to 300 ZTQ-15s, although this number has never been publicly confirmed by the PLA or MND. It also remains unclear whether the PLAMC is in the process of inducting the new lightweight tank. Is China Equipping Its Marine Corps With a New Lightweight Battle Tank?